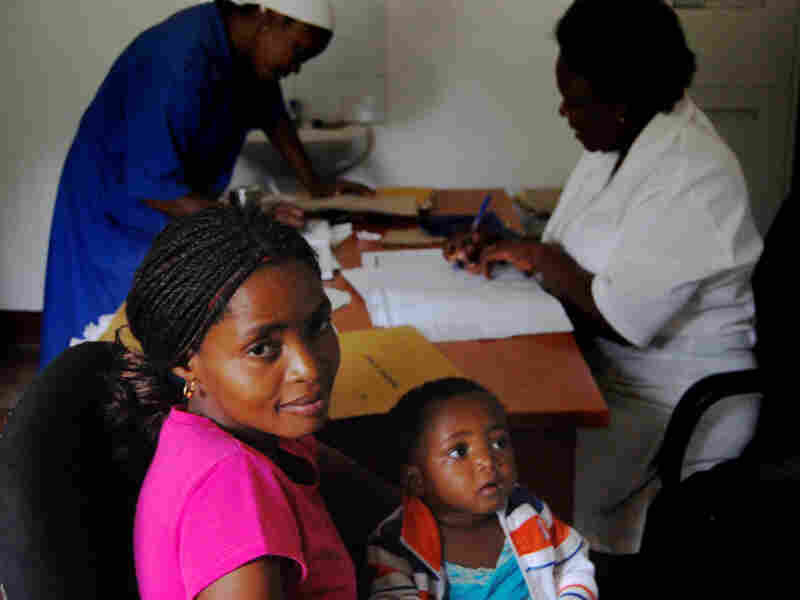 In Mozambique, A Fight To Keep Babies HIV-Free In one province of the southeastern African nation, 30 percent of women are HIV-positive. Pregnant women who seek prenatal care are routinely tested for the virus and, if infected, will be given anti-retroviral drugs to help prevent transmission to their babies. But drug shortages are preventing some women from getting the help they need. Pregnancy and childbirth, as it relates to global health. Lucrecia Silva and her daughter, Helena, are both HIV-positive. They wait as a nurse in Macia writes a prescription for Helena's anti-retroviral drugs. The southeastern African nation of Mozambique has some of the highest HIV rates in the world. Within Mozambique, Gaza province in the south of the country is a hot zone for HIV infection. There, 25 percent of people ages 15 to 49 are HIV-positive. Among women in Gaza, the number is even higher: Thirty percent are infected with HIV. 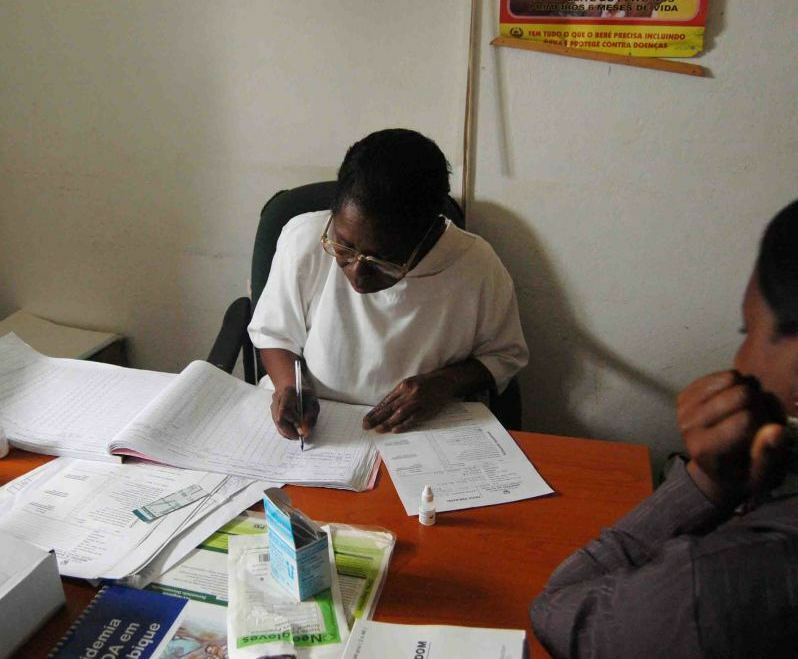 At a health clinic in the town of Macia, 24-year-old Adelia is about to get an HIV test. She's wearing a stylish gray suit and carrying a shiny alligator-print handbag. Adelia is about five months pregnant. And if someone comes here for prenatal care, as she has, that person will be tested for HIV. Nurse Celestina Matavel rips open the test kit, making sure the young woman notices it's a new kit just for her, so there's no danger of contamination. She pricks Adelia's finger and transfers a drop of blood onto the narrow test strip. Then, a brief, anxious wait. The nurse and patient bow their heads closer to the strip as two faint red stripes emerge. "Positive," Adelia murmurs. A second test confirms the result. She is HIV-positive, with a baby due in the fall. She presses her lips together and gets a faraway look as the nurse urges, "Don't be scared." "Relax. HIV doesn't mean you're dead!" Matavel says. "Don't dare lose strength! You'll live your life the same way. When you get malaria, don't you come to the hospital, don't you take medication, don't you live? It's the same as this. Don't think that your life is going to change." 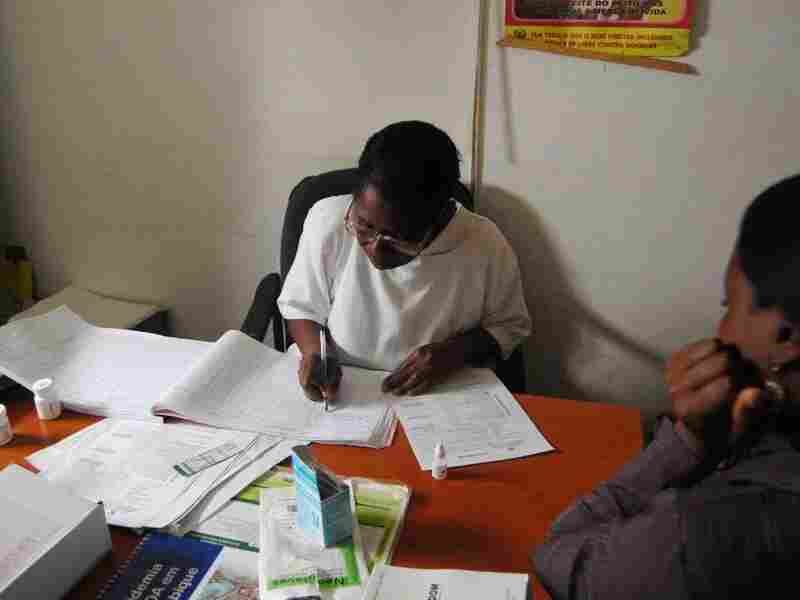 Nurse Celestina Matavel counsels Adelia, who has just learned that she is HIV-positive, at the Macia health clinic. Adelia is about five months pregnant. An American doctor, Nancy Fitch, tells Adelia in Portuguese: "If you take your medication, your baby will be OK.
"I have a lot of hope for you and your child," Fitch says. "You can have a normal life, and your child can too." Fitch is country director in Mozambique for the Elizabeth Glaser Pediatric AIDS Foundation, which supports the work here through funding from the Centers for Disease Control and Prevention. The CDC in turn is funded by PEPFAR, the U.S. President's Emergency Plan for AIDS Relief. Adelia will be put on anti-retroviral drugs through the last months of her pregnancy and while she's breast-feeding, so she doesn't pass HIV on to her baby. The newborn will be also be given drugs to fight HIV infection. Adelia will be advised to breast-feed exclusively for six months, something that's not part of the protocol in the West. But in developing countries, it's believed that the benefits outweigh the risks. If Adelia can stay with the regimen, her baby's chance of being infected can be reduced to about 5 percent, down from 30 to 40 percent if Adelia were to do nothing. Outside, Fitch looks around at the hundreds of women waiting patiently — many of them HIV-positive, with HIV-positive children. "Here, you're probably in one of the places one is most inclined to feel overwhelmed," she says. She says the AIDS epidemic has reversed the steady progress Mozambique had made in reducing child mortality. "In the last 10 years in Gaza, the impact of this epidemic has just been terrible," she says. "So here in Gaza, you're where you feel it's in your face." And Fitch knows the women here are confronting harsh realities. "Babies in the past, if you had an HIV-positive baby, they would just — it's easier to let the baby die, rather than take on a commitment to feed an extra mouth and make all these trips to the doctors, and stand in line one day a month waiting for medication," she says. "It's a burden that a family on the edge could probably not afford." Asked whether that's still the case, Fitch says, "Absolutely. Not everywhere — and there's definitely progress being made. But on a day-to-day level, when you come here and see the effort that needs to be made, it seems really hard sometimes." Nearly all of the money for HIV/AIDS prevention and treatment in Mozambique comes from international donors. The drugs and test kits come from the Global Fund to Fight AIDS, Tuberculosis and Malaria, and from PEPFAR. In fiscal year 2010, PEPFAR's budget for Mozambique totaled $269 million. That's more than what Mozambique contributes to its entire health care system. 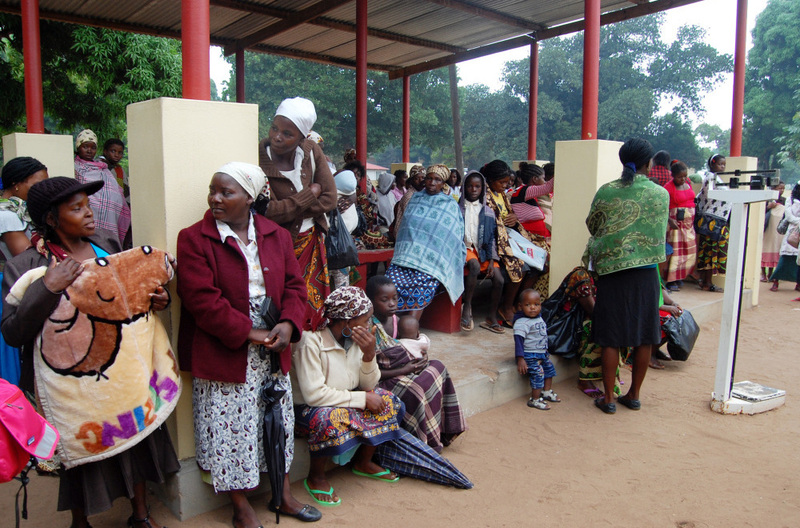 Women wait outside the maternal-child health clinic in Macia. Women who come to the clinic for prenatal care will automatically be tested for HIV. Even with all of this outside aid, about a third of pregnant women in Mozambique known to have HIV aren't getting the drugs to prevent transmission. Lucrecia Silva has brought her 15-month-old daughter, Helena, to the clinic. Helena wears a tiny soccer sweatshirt over her turquoise tulle dress. Both mother and daughter are HIV-positive. Silva is picking up a month's supply of free anti-retroviral drugs for her baby. The drugs will slow the progression of the disease. Without treatment, half of all infants infected with HIV will die by their second birthday. If Silva can't find a ride to the clinic, she'll walk, two hours each way. She says she wants her daughter to lead a good life, to be healthy — and she wants to live a long life. Silva's story illustrates just how the virus spreads. Many men in Gaza province, like Silva's husband, go to South Africa to work in the mines. They're away for long stretches. Prostitution is rampant — and so is HIV. They bring the virus home to their wives. At a Sunday morning service at a Presbyterian church in the village of Malehice, women and children sway as they sing. Except for the pastor, there are no men here. They're either working in South Africa or just don't come. One of the pastor's daughters, Acacia Navete Mukambe, is slim and delicate with a radiant smile. Her 16-month-old daughter, Virginia, dozes through the service in a sling on her mom's back. Mukambe also has an 8-year-old son, Muianga, who's so tiny, he looks about half that age. Mukambe's husband works in the mines in South Africa. She says he got very sick and tested positive for HIV in 2007. "I don't know where he got it," she says. "Now, so many people have that disease. So I didn't give him a hard time about it, because it's possible that he got it from me. But he went to get tested first. So that's why I didn't give him a hard time about him giving me HIV." Mukambe's husband urged her to get tested. But she waited. She was scared, and worried she'd be shunned. She got very sick and terribly thin. It wasn't until she was pregnant with Virginia that she finally had the HIV test. It was positive. Credit: Melissa Block/NPR; Photo: Acacia Mukambe holds her daughter, Virginia. Now, with drugs that fight HIV, her health has improved. She's gained some weight. And baby Virginia has tested negative. But Mukambe faces a problem that's common in Mozambique. Because of drug shortages — or "stockouts" — sometimes she can only get one week's supply of pills, not the whole month's worth. This is a big problem in rural areas like this one, where just getting to a clinic to pick up the drugs can take hours — by foot, or bike. If people have to come back more often to get their drugs, chances are they'll fall off the regimen. And they'll get sick. As Muianga and Virginia play nearby, Mukambe talks about her fears for their future. "Since I have HIV, I'm scared of dying and leaving my children while they're still very young," she says. "But if the medication really works, I'm not going to die of HIV; I'm going to die of everyday illnesses." After church, Mukambe and the other parishioners gather in a circle outside, and her face lights up as she sings these words: "Praying is what gives you hope. I will not go back. I must go forward."